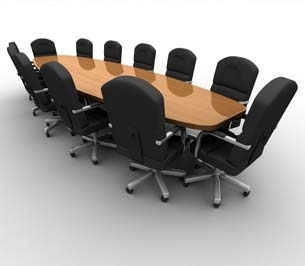 Think of a board made up only of independent directors (acting somewhat as consultants / advisors) all working under a single contract, from a single service provider (vendor) and bound to performance. Sounds like a simple concept to grasp, however, it is truly a new approach - one that should not to be confused with companies that provide executive staffing, individual board advisors, executive coaching or stand-alone independent directors. The holistic approach of a cohesive and collectively-accountable team, directly tied to a client company's performance and bottom line, is not present in these models. It is present, however, in the BSP model along with much needed transparency as well as performance-based metrics. When describing our service to clients we like to say we are an "all or nothing" model - you either get the core board team in its entirety or you get no one. This is due to the belief that it is the collective board's experience, constructive interaction and diverse industry backgrounds that elevates the mission. Additionally, a 'bench' of expert advisors supplements the board team expanding its effectiveness well beyond just the core board members in this type of outsourced model. As I discussed in a previous article, add the element of an elevated 'behavioral predisposition' to the existing 'intellectual capital' of the board team and you have an even more incredible company leadership asset. In essence, the board becomes greater than the sum of its parts. "... A proposal for fixing boards that goes beyond tinkering"
Interesting how in this case academia (UCLA) and practitioner (Integral Board Group) were concurrently focused on solutioning the same issue, but from different directions. There does exist, however, a fundamental difference when comparing the approaches: in our present day approach we are applying the model in its fully-designed capacity only to the private sector. On the other hand, Stephen Bainbridge and Todd Henderson propose this model for the public sector and argue "that this would require only a simple legal change" to enact. Yes, it is most definitely a simple legal change on paper, but likely a larger debate at multiple levels that could slow down its adoption in the public sector. I personally welcome this delay in the public sector as it will allow for focused traction in the private sector first without dilution from politics. We will be ready when the transition from private to public eventually occurs. As we are the first business of its kind, feel free to track our progress - join our newsletter for updates. Schedule your free session via email - email mark.pfister@integralbg.com.